Whether budding photographers, journalists or documentary-makers, children are taking control of their rights and analysing them their own way. Whether through video, photo, radio, written or spoken reporting, children have free rein in making their voices heard and sharing their points of view on their much-discussed rights. On 1 March 2018, the Republic and Canton of Geneva updated its children and youth policy with a new law, which recognises children, “not only as subjects of law who enjoy rights, in particular that of being protected, but also as participants in society who have the right to express their views on issues that concern them”. Child Reporters is an opportunity for children to express their views on the rights that concern them, and to offer their friends and family and the general public their own viewpoints and perspectives. This project is also open to children across the world, who would have to be supported by a Geneva-based partner. The children are asked to put together teams from their classes from school, or from some other place outside school. The School Media Service (SEM) dof the Canton of Geneva’s Public Education Department (DIP) is developing a timetable of classes aimed at teachers for the 2018-19 school year, with the aim of involving classes from compulsory education (from the fourth year, i.e. aged eight and over) and from non-compulsory education (aged 15-19). 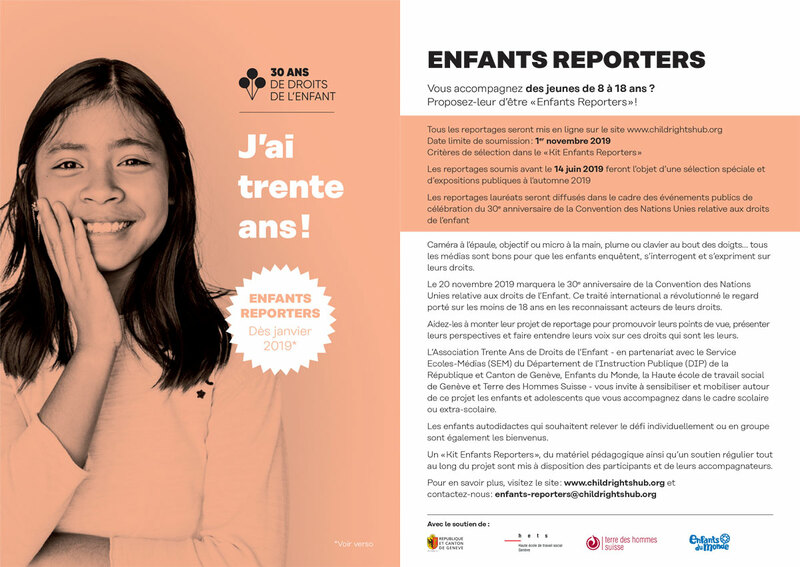 A Child Reporter kit  designed for children and their guardians, which introduces the project, the instructions for implementing it and the main legal and ethical questions inherent to any journalistic work, such as the question of image rights and the principle of professional conduct towards those being interviewed. For the Giving a voice to unseen children theme, a counselling service is available before, during and after the reporting, so as to prepare Child Reporters and offer them psychological and emotional support with their approach to finding and gathering accounts of difficult lives. A whole series of partners is mobilised to enable the setting-up of teams of Child Reporters. There will also be exhibitions of the Child Reporters’ work during and outside the conference.